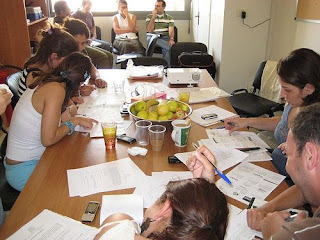 Our second training seminar took place on 24 June at the offices of Catholic Relief Services in Sodeco, Beirut. The tutorial was attended by a dozen or so members of the CRS staff and covered a selection of topics on Web 2.0. We launched the workshop by familiarizing the audience with the concept of Web 2.0 and the different tools that assist in promoting and communicating developmental work through social media. Can a site be Web 2.0 even if it doesn’t encourage a lot of user participation? Can a site be a Web 2.0 site even if it has editors? Who owns the Internet? How does the Internet compromise our security? Or can it enhance it? What exactly is the definition of social media? Some questions we addressed. To answer the others to our satisfaction, we’ve assigned ourselves a bit of homework, a lot of which will be completed as Jessica attends the 2008 Global Voices Summit, a gathering of bloggers from around the world being held this weekend in Budapest. Among the topics to be discussed are censorship and circumvention, free speech, NGOs and activism, and the “wired electorate in emerging democracies.” We’ll be reporting on the summit here on our blog, so check back starting tomorrow for updates. The group created a welcoming, friendly environment (check out the photos at Flickr) where people talked, laughed, and got inspired by the tutorials—one staffer wrote the next day to say she heard a Common Craft video, one of our favorite teaching tools, playing on a colleague’s computer in the next room—and by success stories about how NGOs and individuals have used ICT for peace and positive social change around the globe. We’re hosting the “Introduction to Web 2.0” seminar throughout July. The next sessions will be on July 3, 8, and 15 at UNESCO Palace, from 9 a.m. to 4:30. Lunch will be provided. Sign up to attend one now! Our Pilot Workshop Is a Success!